Item comes packaged in a pink organza draw string bag. Little Cosmetics is quality pretend make-up that look realistic and feel real to the touch. The play make-up does not show up on skin and does not stain. This is not real make-up. Little Cosmetics is play make-up intended for creative play. *Little Cosmetics compacts DO NOT contain mirrors, as glass can be potentially dangerous for small children. **The lip glosses look very real, but nothing shows up on the lips. No paint, chemicals, or dyes on your little girls lips! Standard size lip gloss container with a roller ball applicator. Does not contain actual lip gloss." What we thought: Little Cosmetics play makeup is AWESOME! It really is incredibly realistic! I wasn't sure if A would like it or not. She is really into makeup right now and she has several kits that contain real makeup, so I thought she might be a little wary of Little Cosmetics since they don't show up. Boy, was I wrong! She plays with this set more often than her "real" makeup these days. She thinks the best part about this makeup is that she can use it to give her dolls and stuffed animals (and little brother) makeovers:) Obviously, we never let her do that before, but now she spends hours getting their makeup just right. Not to mention, it is safer on her skin than her other makeup. 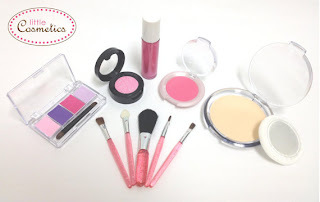 The kits from Little Cosmetics include a variety of makeup staples that are sure to bring a smile to any little girl's face:) ABCD Diaries gives Little Cosmetics an A+! Find Little Cosmetics on Etsy, Facebook, Twitter and Pinterest! I entered the mr diddie giveaway.